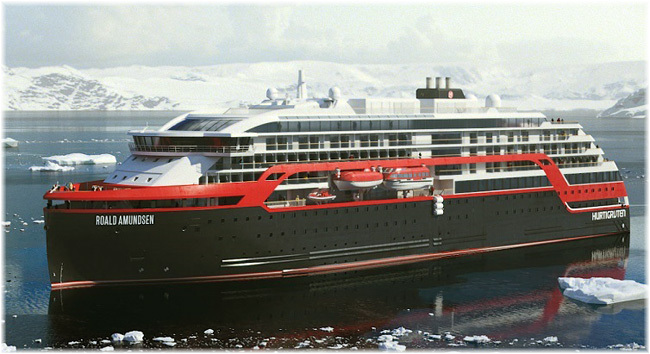 This year sees the introduction into service of Hurtigruten’s new Roald Amundsen and 2020 will see her undertake her first Northwest Passage, which has been delayed a year by her late completion. Elsewhere, Aranui Cruises is ordering a new cruise ship for the South Pacific, for 2022 delivery, and Scylla Cruises of Switzerland has annouced that it will acquire Hapag-Lloyd Cruises’ Bremen in 2021. Since 1893, Hurtigruten has operated a daily coastal passenger and cargo service linking thirty-four communities on Norway’s coast. In recent years, this has expanded to include voyages to Greenland, Spitsbergen, Iceland, Europe, South America, Central America, the Canadian Arctic and Antarctica. All of the ships in their fleet offer modern facilities and some were designed specifically to sail in remote areas. Hurtigruten has offered polar expedition cruises for many years now, aboard its 254-berth former Greenland vessel Fram, and 636-berth fleetmate Midnatsol and the more recently acquired 335-berth Spitsbergen. Many of Hurtigruten’s guests traditionally come from Germany and Scandinavia, with a number of Brits, Australians and North Americans as well. Beginning in the summer, of 2020, Hurtigruten will operate its first cruises to Alaska, sailing from the Port of Vancouver. After she arrives from her first 2019-20 Antactica season, the 20,889-ton 530-berth Roald Amundsen will offer a series of 13- to 17-night itineraries from Vancouver to Alaska. She will sail 13-night itineraries between Anchorage and Vancouver, as well as 14-, 15- and 17-night round voyages through Alaska and the Inside Passage from Vancouver. A 17-night voyage will also sail as far north as the Aleutian Islands. At the end of the 2020 season, in late August, the Amundsen will offer a 28-night Northwest Passage cruise from Nome, via the Canadian Arctic and ports in Greenland, to Halifax. 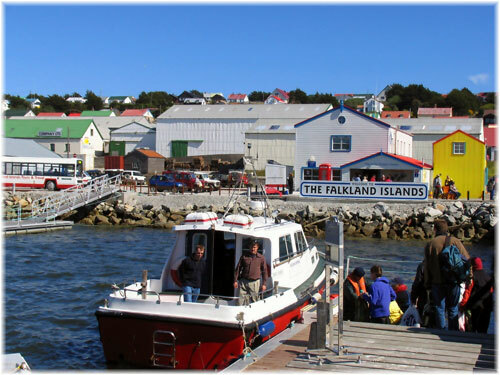 At the same time the smaller Fram will be operating a Northwest Passage cruise of her own from Kangerlussuaq to Cambridge Bay and back again. The new ship is named after Norwegian polar explorer Roald Amundsen, the first person to reach both poles, and leader the first successful expedition to traverse the Northwest Passage. The Roald Amundsen is set to enter service this year, with itineraries exploring Norway, Western Europe, the Chilean fiords, Antarctica and the Falkland Islands before making her Alaska debut next year. The Roald Amundsen will enter service this year and be followed by near sister ship Fridtjof Nansen in 2020, while a third as yet unnamed ship is due to follow in 2021. 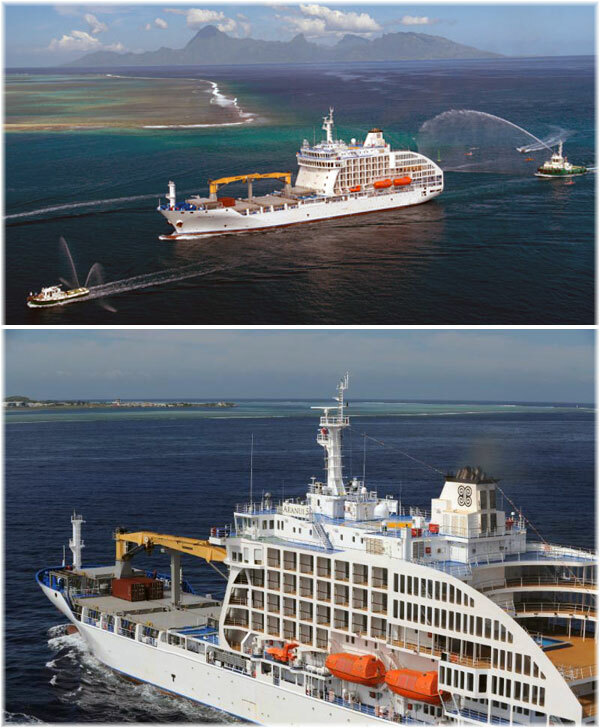 On January 14, on the event of the line’s first call at Pitcairn, Aranui Cruises, or Compagnie Polynésienne de Transport Maritime (CPTM), announced that it is ordering a new ship from the Hunghai Shipyard in China, the same yard that completed the Aranui 5 in 2015. This passenger-cargo ship replaced the Aranui 3, which dated to 2003 and has since been sold to Middle East owners. With additional tourism and more demand for the Aranui 5, CPTM has decided to order another ship, this one directed more towards the passenger trade, with perhaps some residual capacity for cargo as well. The “Aranui 6” project will result in a small cruise ship. Construction will start next summer, with a view to placing the new ship into service in 2022. From this move, CPTM could be about to develop its cruise business quite significantly by introducing new itineraries. 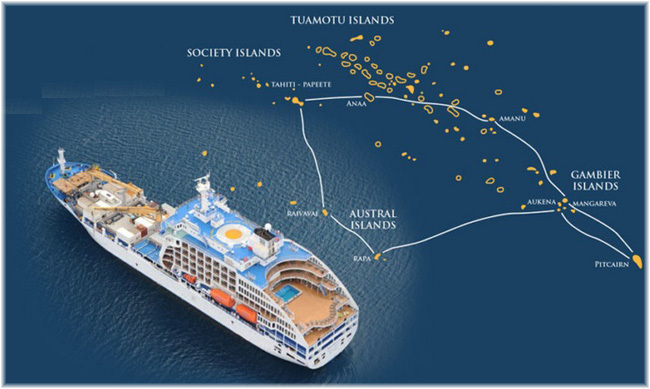 The traditional route has always been from Tahiti to the Tuamotu and Marquesas islands. And now, the Aranui 5 is undertaking her first voyage to Pitcairn and will make a second call in March. Philippe Wong, owner of the Aranui 5, made the new ship announcement in Pitcairn. The ship will carry about 400 passengers in 200 cabins, more space than is offered by the 332-berth Paul Gauguin, with 166 cabins on her regular cruises from Tahiti. Yet another operator has entered the booming expedition cruise market as Scylla Tours of Switzerland has announced that it is acquiring the 155-berth Bremen from Hapag-Lloyd Cruises. The company will take delivery in May of 2021. Scylla owns thirty-one river cruisers that it charters to various tour operators, and is looking now to enter the ocean market. “The MS Bremen is perfect for that. Our nautical and technical expertise also comes into play here. What’s more, we can offer our existing customers new options in Scylla quality and expand our customer base,” said Arno Reitsma, ceo of Scylla. Hapag-Lloyd Cruises, meanwhile, will take delivery of its third “Hanseatic” class ship, the 230-berth Hanseatic Spirit, in 2021, to replace the Bremen.